Okay, here's what Book Expo America was like: imagine that every publisher in the United States magically transported a row of their offices (complete with carpets and closets) into an enormous room, broke down the walls on two sides, and invited 30,000 of their nearest and dearest to traipse through while carrying up to six tote bags each full of books that they swung wildly about as they scoured the "offices" for freebies. - Scouring for freebies on Friday with Scott Westerfeld, Maureen Johnson, John Green, and Kate Schafer. - Scouring for freebies on Saturday with my fellow 2k7ers: Carrie Jones, Greg Fishbone, Laura Bowers, Jo Knowles, and Paula Chase. - Chatting with some of the terrific people from my publisher, Penguin Young Readers, who made INTO THE WILD a reality. These included Jess Michaels, Ben Schrank, Doug Whiteman, Mary Margaret Callahan, Holly Ruck, Meredith, Ev, and Todd. - Having a lovely lunch with the lovely Jeri Smith-Ready. - Hanging out at the ABC (American Booksellers' for Children) reception at the Copacabana with Jordan Sonnenblick, Maryrose Wood, E. Lockhart, K.L. Going, Jo Knowles, etc. (Yes, the song was sung. And Jordan made me promise that if he died at the Copa, that I would sit there so refined and drink myself half-blind. This was not as unlikely as it sounds since Jordan's allergic to shrimp, and nearly every appetizer involved shrimp.) After the reception, I got to eat dinner with a table full of awesome people including Brenda Bowen and Nancy Fraser. 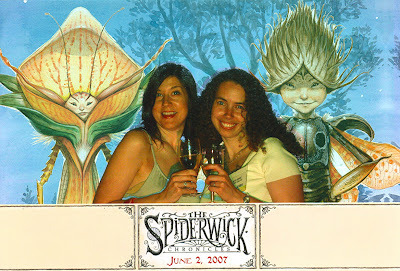 - Hanging out during and after Simon & Schuster's Spiderwick Chronicles party with Holly Black, Cassie Clare, Scott Westerfeld, Justine Larbalestier, Maureen Johnson, Delia Sherman, Ellen Kushner, etc. HUGE thanks to Holly for getting me into the party. She is sooooo sweet. ... another room decorated with large butterflies and giant mushrooms. The bar was draped with a Premium Saltines cracker sign, and I very cleverly asked, "Why is Holly's party sponsored by Saltines?" To which, Scott very patiently explained, "It's not. We've been shrunk down to the size of sprites." And that's when I noticed the tables made to look like giant sticks of gum, the huge butterflies on the ceiling, and the room divider that looked like blue jeans. Oh, and there was also the Largest Hamburger I've Ever Seen. It was a real hamburger which they sliced up like cake. Not enough name-dropping? Here are a few other very cool people that I saw/met/talked with for at least a few seconds at BEA, in no particular order: Sara Crowe, Ally Carter, Bruce Coville, Zahra Baird, Libba Bray, Lisa Ann Sandell, Sheila Ruth, Peter Glassman, Kelly Link, Gavin Grant, Carol Chittenden, Jenn Laughram, Monica Edinger, Betsy Bird, Theo Black, John Joseph Adams, Mary Brown, Barry Goldblatt, David Lubar, Laura Anne Gilman, Andrew Karre, Melissa Marr, Rachel Vater, Anne Hoppe, David Levithan, Jeannine Garsee... and several other wonderful people who I apologize to for not mentioning. How cool is that! Now I'm not just a blurbee but a blurber too! And today I'm back to my normal day, where I get to see a sum total of two people. But hey, they're pretty cute, so it's all good. I'm just practically drooling with, well, not envy exactly, but wow! You keep rubbing shoulders with my favourite writers, and I suspect you're about to be one of my favourites as well, as soon as I get my hands on your book! :) I'm glad you had such a great time! Sounds like you had a great time at BEA, craziness and all. You're right about the Mirrorstone/Wizards of the Coast booth; that's one of our favorites, too. Very cool that you're a blurber as well as a blurbee now! We picked up an ARC of Hallowmere, and now that I know that you blurbed it, I'll definitely have to read it! The Spiderwick party sounds so phenomenally cool! It's so awesome that your now a "blurber" ;-) That's such a cool word! Faith: Thanks! Only 15 days until pub date -- eeeek! I hope you do like it. Sheila: In addition to the couch, that booth also had bagels and muffins. Yay for free food! Hope you had a great time too. Erin: It was phenomenally cool. I've never been to a party involving special effects. Not counting disco balls. Greg: Very fun, fun, fun! Glad we got a chance to hang out. Hope you had a good time in Philly. Very cool!! Guess what? I got an agent!! And an editor is calling me next week with "questions." Heidi: Yay!!! Fabulous news! Congratulations! *blush* Thanks, Tiffany! You're fabulous too! Looking forward to seeing you at ALA. This is a belated response, but I'm glad you had such a great time at BEA and such a good booksigning and milk that will last until your release date! Come back down to Austin sometime soon. We love Sarah Beth Durst! Thanks, Jo! Are you coming to World Fantasy this year? Hope to see you again soon! Alas, I can't because I'm already going to the SCBWI Summer conference (which you should attend!). Remember to wear your superpower bracelet to WFC!